In 1907-1908 Oneida Brewing Co. in Utica, NY published a series of ads so innovative one rarely or never sees the like today. Oneida Brewing had roots in George Ralph’s brewery established in Utica in 1832. The business, re-named Oneida Brewing Co. in the 1880s, endured until Prohibition. A brewery under the same name was restored after Repeal and lasted until 1942. For a basic timeline see Tavern Trove, here. Brewers, of whatever scale of operation, rarely go into detail when describing their processes to the public. Some have always spoken of the hops they use, how traditional/old-fashioned their beer is, or, in an earlier period, how modern, but rarely advertise details of production processes. Oneida Brewing went counter to this trend in a remarkable four-part series in upstate New York newspapers that described its processes, some in great detail. The articles were entitled, “Old Tyme and Modern Methods of Brewing Oneida Ale”. The series actually comprises five parts but the fifth is simply a comparative illustration, of a rustic tavern vs. a contemporary “palatial” hotel bar in New York City. The main parts comprise, first, mashing and boiling; second, cooling; third, fermentation; and fourth, racking/storage/aging/filtration. The links are to New York newspapers that carried the ads from the newspaper archive of Thomas Tryniski’s excellent Fulton History website, here. There are many details of interest in the pieces, examples include sources of the hops used (Oneida County, NY and Washington State), the fact that fermented beer formerly was cooled with “swimmers”, containers of ice floating on the beer; comparative aging regimens (modern beer was aged longer); filtration by forcing the beer through paper sheets, still used by some breweries today, cold-aging, long boiling (three hours), and much else. It appears Oneida ale was all-malt as there is no reference to malt adjuncts or cooking of raw grains. Only ale is mentioned, and by our researches lager was not brewed by the company until about 1914. I found ads for Oneida India Pale Ale until about 1901 but this branding does not appear in the series mentioned. We suspect this form of ale was considered by 1907 old-fashioned. Oneida Ale, as such, in 1907-1908 was bright, filtered of any deposit of yeast, and (in part) cold-aged with industrial refrigeration. It was thus the new-style sparkling, or lagered ale, to use our modern terminology. 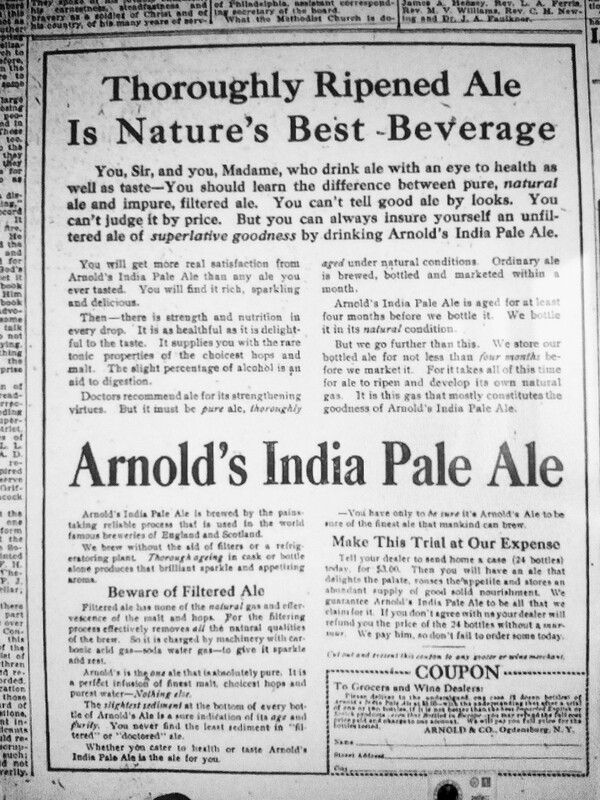 In contrast, in 1910 the Arnold brewery in Ogdensburg, NY was still advertising that its ale was not filtered, artificially carbonated, or processed with refrigeration. Oneida sought to show that its beer was superior by dint of modern methods and technology; Arnold argued the contrary, in a way that resonates with our modern craft world. 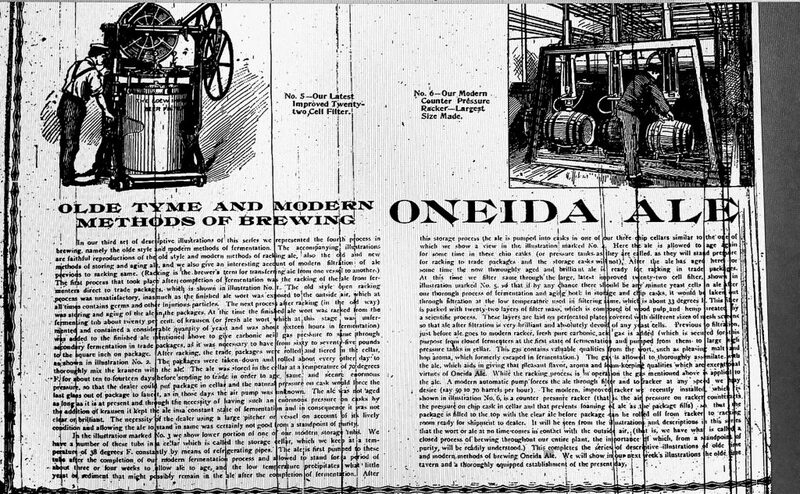 A theme recurrent in the Oneida ads is purity, in particular that its beer was less exposed to ambient air than in “Old Tyme” methods, with the implication that infection and contamination were minimized and consistency, boosted. In contrast, Arnold argued that its ale was more natural and the way the éminence grise of English ale, Bass ale and similar brands, were made. In truth, even in the U.K. brewers were moving away from Arnold-style bottle-conditioning in favour of the dinner or sparkling ale method – the same Oneida vaunted – but if Arnold knew that, it didn’t say. This new type of ale was becoming popular as an alternative to various forms of old-fashioned stock, still, musty, and old ale. From 1903 Molson Export Ale similarly showcased the new type of sparkling ale in Canada. Oneida’s ads have an earnest quality yet a purposeful tone that escapes being called naive. The company clearly believed in advertising and wanted to reach customers and prospects in a novel way. It also advertised in conventional ways in the upstate press, showing pictures of its product with a brief description. In upstate and Central New York, even still in Manhattan, ale and porter had a sale, a heritage of early British and Dutch incomers. Some of the names were Arnold, Ballantine, Evans, Greenway, Hinchcliffe, West End Brewing in Utica itself (now Matt’s Brewing), and what is now Genesee Brewing in Rochester. Even after 1933 top-fermented beers came back although by then almost always well-carbonated, chilled, deposit-free. Lager had made great strides by 1914 but ale was still lucrative and the remaining ale and porter brewers vied to obtain their share of the market. In Teddy Roosevelt’s America Oneida Brewing hit on a technique modern brewers might reflect on. Educate the consumer. Note re image: the images above were obtained from the news sources identified and linked in the text. All intellectual property in the sources belongs solely to the lawful owner, as applicable. Images sed for educational and historical purposes. All feedback welcomed.